Using Disk Utility (/Applications/Utilities), you can create a disk image—a sort of virtual hard drive—from any folder in OS X. I use disk images for quite a few things: Classic lives on a compressed disk image on my Mac. I make disk images out of game CDs—you can play some, but not all, games with the disk image mounted instead of having the original CD in the drive. I also keep a FileMaker Pro database of passwords and other sensitive information on an encrypted disk image, which I can travel with, with some degree of security. Want to avoid the tedious process of opening Disk Utility, selecting Image: New: Image From Folder, and then navigating to the folder you want to turn into a disk image? You can. Drag-and-drop disk-image creation disappeared from OS X 10.3 but quietly returned to OS X 10.4. Now just drag your folder onto the Disk Utility application icon—whether it’s in the Dock, the Finder, or the Finder’s sidebar or toolbar (see “Quick Disk Images”). Disk Utility will launch, displaying the New Image From Folder dialog box. Select an image format (options include Compressed and Read-Only), and then decide whether you’d like to encrypt the image so only you can open it. That’s it! Quick Disk Images To create a disk image quickly and easily (in OS X 10.4 or 10.2, but not 10.3), just drag and drop a folder or folders onto the Disk Utility icon. When you use Spotlight to search in OS X 10.4 (by pressing Command-spacebar or clicking on the Spotlight icon in the menu bar), the results appear in a drop-down list, sorted into groups: Applications, Documents, Folders, and so on. Once the results appear, you can select any item in the list with the mouse, or by using the up- and down-arrow keys. But the keyboard shortcuts don’t stop there—these tricks can also help you quickly get to your selection. First, if you want to select the Top Hit item, just hold down Command and press return. To quickly jump between categories, use Command-down arrow and Command-up arrow. Once you’re in the desired category, use the arrow keys to scroll through it. You can jump to the bottom or the top of the entire list by pressing control-down arrow or control-up arrow (or by using the end or home key). Finally, if you want to modify your search term, you can press control, option, or Command and the left or right arrow to jump to the beginning or end of the search field. Apple’s iCal lets you use three views to check your calendars: Day, Week, and Month. For the Day view, you can choose the number of hours visible on screen by going to the program’s preferences. But there may be times when you want—or need—to see more hours (say, for long days with travel and late appointments) or fewer hours (for days when you don’t have much going on). Fortunately, there’s a simple way to change this without having to take a trip to preferences. You can do it with your mouse’s scroll wheel, or even with two-finger scrolling on a trackpad (on a Mac laptop that offers this feature, such as the MacBook Pro and certain PowerBook G4 models). As you scroll, you’ll see more or less information for each event—the more hours you show, the less information will be visible. If your iCal window is small, you’ll lose the times for some or all of your events, which will shrink to one line. Show fewer hours to expand your events. Do this as needed, and you no longer need to worry how many hours you set in iCal’s preferences. If you frequently use photos in documents or send them to friends and family, you might have discovered that you can drag your shots from Apple’s iPhoto 6 (part of the $79 iLife ’06; ; April 2006 ) into almost any application. At times, though, being able to grab a single picture without launching iPhoto would be convenient. After all, the program can take a while to launch if you have many pictures or a slow Mac. If you have iPhoto 6 and OS X 10.4, you can use Automator to access a systemwide photo browser that gives you quick access to your entire iPhoto library. To start, open Automator. In the Library column, click on iPhoto. A list of actions will appear in the Action column. Select Ask For Photos, and drag it to the right-hand pane. Select File: Save. Give the workflow a name, for example iPhoto Browser, and then choose Application from the File Format pop-up menu to save your workflow as an application. Save it anywhere—in your Applications folder, perhaps. (Later you can drag this little application to the Dock if you plan to use it often.) Finally, click on Save. Pick a Photo Using Tiger’s Automator, you can create a one-line program that will display this handy iPhoto library browser; then choose one or more images from the browser and drag them to where you want to use them. Launch the application to view its simple interface (see “Pick a Photo”). From here you can scroll through your entire library, select an album and scroll through its contents, or use the Spotlight search field to search for a photo by its title or keywords. When you find a photo you want to use, drag it to the desktop, to a folder, or straight into a document or an e-mail message. You can also select multiple photos by holding down the Command key and clicking on several pictures. You’ll probably find this browser much faster than iPhoto when you’re trying to find a picture. The only difference is that you don’t have iPhoto’s export options—dragging pictures from this browser will always give you full-size photos. You can use OS X’s built-in ability to create systemwide keyboard shortcuts to change the behavior of Command-N. First, open the Keyboard & Mouse preference pane; then click on the Keyboard Shortcuts tab. Using the options here, you can assign any action you’d like to Command-N, once you reassign its current function to a new shortcut. in the Menu Title field, and enter Command-N in the Keyboard Shortcut field. Click on Add. Go Old School Are you a longtime Mac user who wishes that the Command-N shortcut still made new folders in the Finder? If you’re running OS X 10.4, you can make it so, using nothing more than the system’s built-in tools. Now close the preference pane and switch back to the Finder. To make your changes take effect, you need to restart the Finder. One easy way to do that is to press and hold the option key and then click and hold on the Finder’s Dock icon. When the contextual menu appears, select Relaunch. 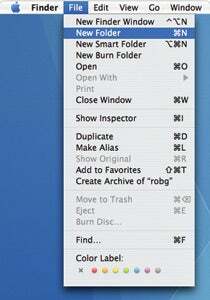 If everything worked, your shortcuts will appear in the File menu when the Finder restarts (see “Go Old School”). Your last task is to reassign the New Finder Window command to the shortcut Command-shift-N, completing the swap. (You can’t do this during the previous step, since you must free up one of the keyboard shortcuts in order to assign it to the other command.) Open the Keyboard & Mouse preference pane again and click on the Keyboard Shortcuts tab. Scroll through the list of shortcuts until you see the Finder entry in the Application Keyboard Shortcuts section. Click on the disclosure triangle next to the Finder entry, and you’ll see the two commands you created. Click on the shortcut next to the New Finder Window entry, enter Command-shift-N, close the preference pane, and then relaunch the Finder again to make the newly assigned shortcut effective. If you decide that you prefer the standard OS X behavior, go back to the Keyboard & Mouse preference pane, click on the Keyboard Shortcuts tab, scroll down to the Finder entry, and find the two Finder shortcuts you created. Highlight them both and click on the minus sign (-) to delete them. Restart the Finder, and you’re back to a stock setup. OS X 101: Is it running? One thing that trips up new Mac users who’ve switched from Windows is the different behavior of application windows in OS X. In Windows, if you close your last Word document’s window, for instance, you quit Word. That’s not true with the Mac—the file you’re working on and the application itself are more independent of each other. In OS X, if you close a window in an application—via the red dot in the upper left corner or the File: Close Window menu item—you almost certainly haven’t quit the program itself. Look at the menu bar at the top of your screen to see. If you close a Word document, for instance, you’ll still see the Word menu next to the Apple menu, which indicates that the application is still active. (Like any good rule, this one has exceptions: some programs that use only one window, such as System Preferences, iPhoto, Backup, and Calculator, will quit when you close their windows.) To quit any program on the Mac, choose the File: Quit menu item, press Command-Q, or control-click on the application’s icon in the Dock and choose Quit from the contextual menu. Application Avalanche If your computer is feeling slow, check the Dock to see what’s running (as indicated by black triangles beneath icons). Leaving too many programs open at once can cause your system to slow down. So how can you tell what’s currently running? There are two very easy ways. The first is to just look at the Dock. Any running program’s icon will have a black triangle beneath it, or the triangle will be beside it if you’ve moved the Dock to a screen edge (see “Application Avalanche”). Tired of waking up to your boring old clock radio? Use your Mac as an alarm clock instead, and you can wake up to your favorite music. All you need are a few built-in OS X tools: Automator, the Energy Saver preference pane, and iTunes. To begin, open Automator. Click on Finder in the Library column. Then in the Action column, click on Launch Application and drag this action to the workflow area at the right of the window. Select iTunes from the application pop-up menu. Click on iTunes in the Library column; then drag the Get Specified iTunes Items action to the workflow area and place it below the first action. Click on the plus-sign button (+) and select a playlist. With iTunes still selected in the Library column, drag Play iTunes Playlist to the bottom of the workflow area. Select File: Save. Name the workflow and select Application from the File Format pop-up menu.